← Old is the New New: Our latest book “Windsor Then” is born. This photo has been perched on my virtual desktop for over a month. Every now and then I would catch a glimpse of it and I would tell myself, Ok, DO SOMETHING with that photo so you can get it off your damn desktop! The building had caught my eye in the spring when I was stopped at a light on Ouellette Avenue a few blocks north of Tecumseh Road. I grabbed a quick shot with my trusty pink pocket camera. Such a beautiful structure – simple in design but with nice little touches like the arched doorway, the recessed façade with that sort of checkerboard area at the top, and those groovy decorative cement accents at the roofline. Ouellette south of Elliot Street is dotted with several other charming old apartment buildings. I have one particular favorite that I must take a photo of one of these days. It’s yellow brick and has aqua downspouts, which were once shiny copper color I imagine, running down the facade. I think it is possibly Art Deco in design. I was once so madly in love with that building it was my number one choice as my first apartment when I moved out of my parents’ house in the early 1980s. My emotional attachment was so strong in fact that I ignored what my gut was trying to tell me when I met the manager. Alas, shortly after moving in he showed his true colors (ie., creepy pervert) so sadly, I had to vacate my beloved apartment to a nice old building on Giles. I’m sure the creep is long gone but happily, the building he managed still stands. Along with the Prince of Wales, I hope it never has a date with the wrecking ball as so many gracious old homes have on Ouellette. 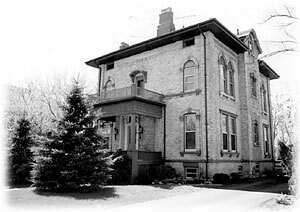 McEwan Manor at 131 McEwan was originally owned by John McEwan, sheriff of Windsor/Essex and editor of Windsor's first newspaper. In 1854, he and his wife attempted to save Norwegian immigrants stricken with cholera. A reader’s architectural query opens the door to an astonishing time in Windsor’s history. read the fascinating answer to Robert’s question here. 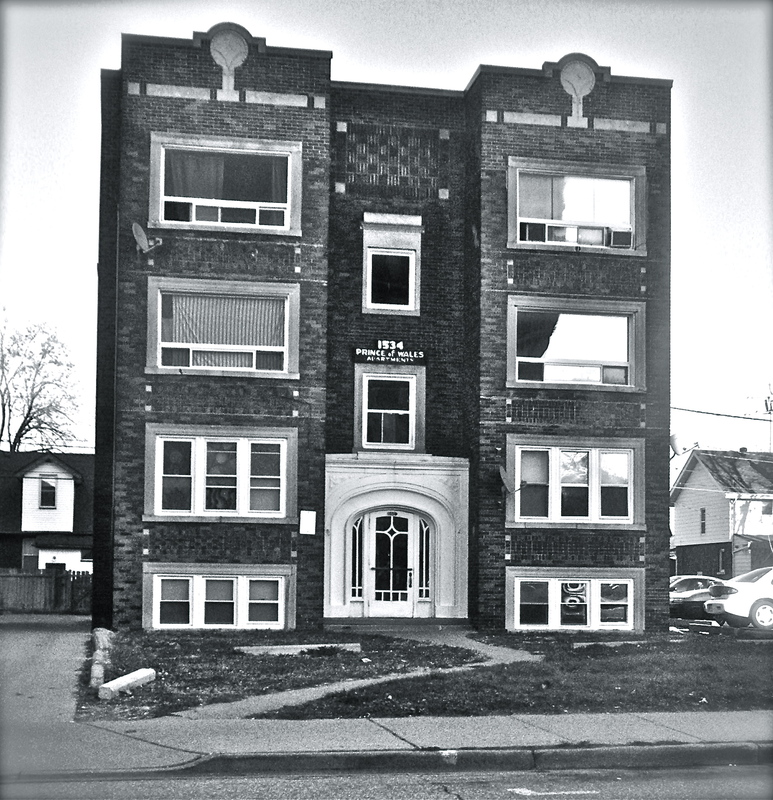 This entry was posted in People, The Straits, Windsor Now, Windsor Then and tagged 1854, 1980s, apartment, architecture, buildings, camera, Canada, cholera, creep, death, facade, feeling, Giles, gut, heritage, immigrants, lost, My Old House, mystery, Norwegian, now, old, Ontario, Ouellette, pervert, photo, photography, preserved, Prince Wales, Prince Wales Apartments, saved, then, tragedy, train, Windsor, wrecking ball, yellow brick. Bookmark the permalink. 5 Responses to I love old buildings WAY too much. I love old buildings so much that I´m even on an undertaking to rebuild some of them in São Paulo. Do you find it too insane? I was told long ago that the clay deposits around London are the reason there are so many yellow brick buildings around there. Hauling clay would have been expensive, so if you see a yellow brick building it Windsor, it was probably for someone wealthy enough to pay the extra charges. I’m not sure what the local (Windsor) clay colour is, but my guess would be in the red-brown range, based on the colour of the brick buildings there. Yes, that’s the answer Brenda. It’s a Moorish type of architecture, and modeled off of a famous building of the same name in Spain. I used to live across the street from Prince of Whales, at a smaller place called Mayville. Now I’m in Windsor Court. Thanks Aaron! That is definitely the building. I wonder who designed it and had it built. I am amazed it is still standing.